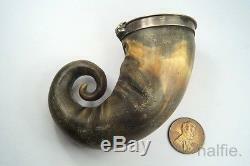 ANTIQUE VICTORIAN PERIOD SCOTTISH SILVER HORN SNUFF MULL c1840. 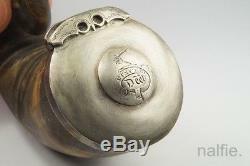 An antique Scottish mull / snuff box, its body made of natural horn with solid sterling silver fittings and hinged cork-lined lid, engraved with a cartouche reading'DW' below'Vincere' ('To Conquer') in a buckle crest. An attractive and fabulously collectable mull, a guaranteed 100% genuine period example! 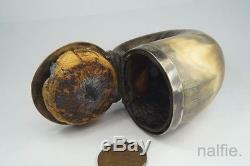 Slight signs of wear, some loss to horn (possible natural) near lid. Top appears to have been cleaned with an abrasive or similar, could do with oiling. DATE/MARKS : Early / mid 19th century. DIMENSIONS : 3 ¼ inches long. Diameter of lid 38 mm (1 inch = 25.4 mm). To give an impression of scale, the coin is 19 mm or ¾ of an inch diameter. All orders are sent professionally packed & fully insured for your peace of mind! Please don't forget VAT is payable on all items apart from gold coins! See below for further details. The item "ANTIQUE VICTORIAN PERIOD SCOTTISH SILVER HORN SNUFF MULL c1840" is in sale since Tuesday, April 26, 2016. 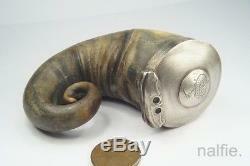 This item is in the category "Collectibles\Tobacciana\Snuff Boxes".